Whole House Chloramine Water Filter Plus. This is a fantastic, effective and affordable whole house chloramine water filter. 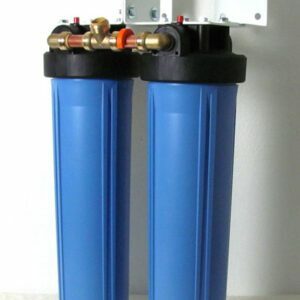 Both filter media in this unit are optimized for chloramine removal. Will also filter chlorine. 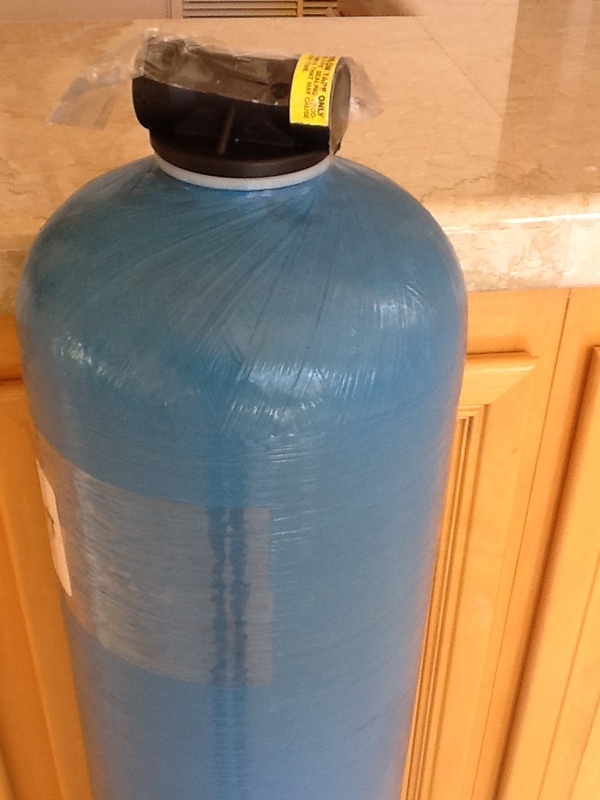 This is a single tank whole house chloramine filter for use on water that has chloramine as the disinfectant. If your municipality goes back and forth between chlorine and chloramine, this is the unit to get. Additionally this is a wide-spectrum filter. 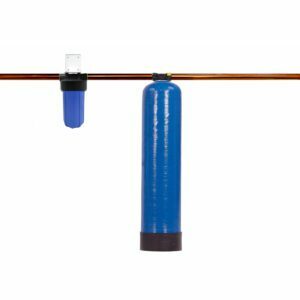 You won’t find a more effective chloramine removal filter. See the Test Results tab to see the results of factory testing, which resulted in 100% removal of chloramine. We never guarantee that a filter will remove all of anything. 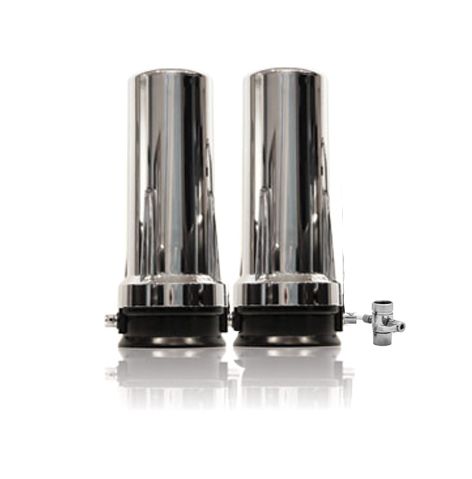 We do guarantee that this filter uses the best materials and the patented process assuring highly effective filtration. We’ve never heard of another that can do nearly as well on chloramine. This will do a lot more at a lower cost than others – while delivering a powerful water flow. Stays effective for 350,000 gallons! Check your pipe size. Default is 3/4 inches. 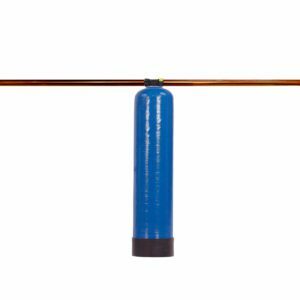 Select 1″ head if your pipe is a 1 inch inside diameter pipe. Does NOT require a backwash! The fantastic level of chloramine removal is made possible by the combination of unique and patented kdf FOAM ADVANTAGE! (Click the link.) Combined with top quality catalytic carbon, which is optimized for chloramine removal. At 350,000 gallons just replace the filter media. Or get a great price on a complete new filled tank with new media in it, making the refill simpler. We recommend the full-tank option. It’s far simpler to swap out the filters. And you get a new tank! We recommend that you get a pre-filter for protection of the expensive media for when your municipality works on the water lines, putting a lot of sediment into the water. You can get the Big Blue 10″ filter or Big Blue 20″ filter. 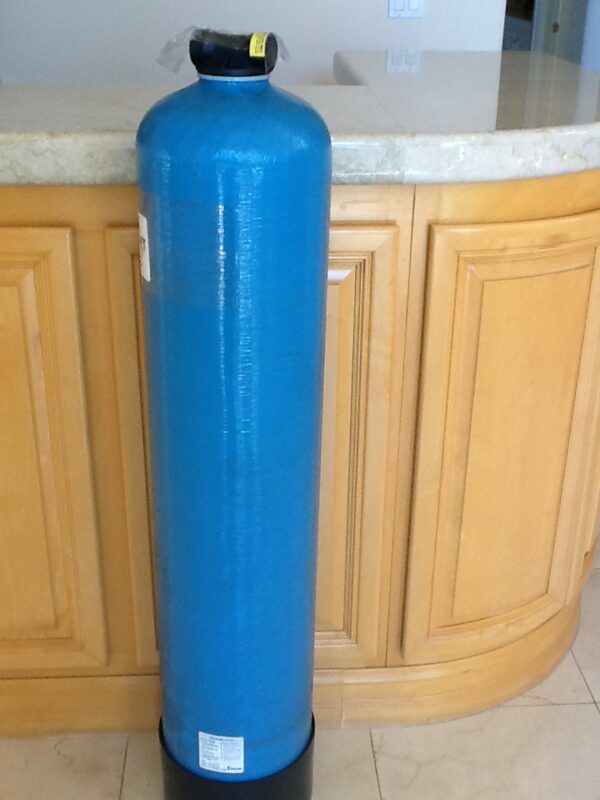 We also have an option of this bundled with a second tank, 3 added filter materials, and a pre-filter. See Large Advanced Upgrade under Whole House Filters. Click on: Frequently Asked Questions. All filter materials used have been certified by the NSF.For certifications of the kdf and tanks for this unit, see this page. This unit uses the FOAM ADVANTAGE patented process for powdering and shaping kdf that is unique to our manufacturing partner. See the Test Results tab to understand the power of this technology. Email or call us with any questions. [email protected] or 866-482-6803. The tests on this whole house chloramine water filter as reported below were performed in-house at the US factory. The results are remarkable. Chemistry is complex, and you may get slightly different results. However, the results show 100% chloramine removal, and you can expect very similar results. We’ve never seen filters that do better. The FOAM ADVANTAGE is what makes it possible. Initial testing was done to verify the amounts of medias needed to successfully break the bond formed by the chlorine and ammonia in the chloramines. Calculations proved 16 lbs of patented foam cubes and one Cu. foot of Catalytic Carbon to be the appropriate amounts of media. As shown in these charts a test tank was set up using amounts of ammonia and chlorine (listed below) to create a chloramine level of 2.12ppm. (Your levels may vary.) Tests were then taken at a series of flow rates up to and exceeding 10 gpm. Test Tank: 55 gallon Drum. The tests show that all of the chloramines have been successfully broken down and the separate parts were removed! This unit is designed for use on municipally treated waters only. Any other water type may need additional treatments and disinfectants. WHAT DO THESE MEDIA FILTER? The combination of kdf 85 with catalytic carbon means that you get thorough filtration of the contaminants you might normally find on a municipal system – with a particular focus on chloramines. The patented FOAM ADVANTAGE process for preparing the kdf means it works much better – and lasts a lot longer – than kdf without that process. It also makes the carbon more effective and longer-lasting. You don’t need a backwash to fluff the material – it doesn’t compress. This whole house chloramine water filter and all the whole house filters we sell use media that has been certified by the NSF, and has been proven to filter hundreds of contaminants including chromium, chlorination byproducts, asbestos, iron, hydrogen sulfide and hard scale. Kdf has been shown to take out chemical-based contaminants and carbon removes organic contaminants. The filtered water is noticeably softer without the addition of salts or chemicals. There are no membranes or filters to replace. Clean water is always available. Healthy trace elements remain in the water. To see a sample list of contaminants filtered by the whole house chloramine water filter, see What Is Filtered? Fittings: 3/4″ default inlet/outlet. Or select 1″ head if you have a 1″ pipe. We installed the whole house chloramine filter two years ago. We are very satisfied with elimination of chlorine smell in the shower and taste in water. We removed a salt based softener and have not had issues with hard water film build up either. We have had this unit for 2.5 years and it is fantastic. No more toxic smell in the shower or on our clothes from the washer. The water tastes crisp and clean. I highly recommend this filter for anyone wanting to reduces toxins and chemicals in their life. Clean water is the foundation of health. 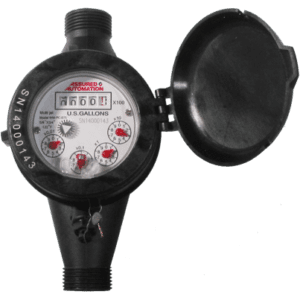 I have peace of mind now in regards to water usage in my home with the whole house chloramine water filter. Every time I use water in any way, I know it is clean and pure. Prior to purchasing this unit, I did research water filters and thankfully Friends of Water filled in the missing areas that most filters do not address, such as what one’s local water company uses (chloramine or chlorine) as a disinfectant. Also, I had never thought about the water for washing dishes, laundry, etc as a way to also exposing myself to chemicals. I will be healthier now for the rest of my life.